Sony Xperia Z was announced back at CES in January and its popularity grows bigger by the day. We have already had the Sony Xperia Z for quite a while in our office and its in-depth review is over here but once the MWC wrapped up we were also able to complete its battery test. The smartphone has a large 2330 mAh battery to rely on, but the quad-core Krait CPU and the 5″ 1080p display are known to consume quite a lot of power. The fact that the battery isn’t user-replaceable puts even more pressure on the Xperia Z to do well here, and we were as curious as you are to find out if that’s actually the case. Our battery stress tests begin with 3G talk time. 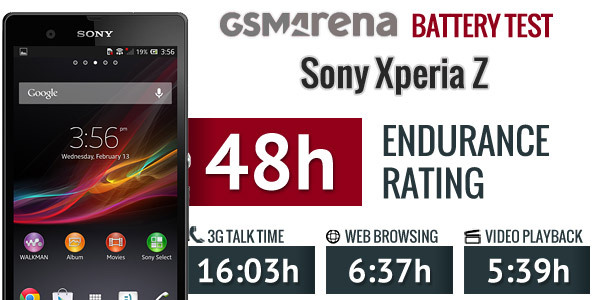 Sony claims the Xperia Z will last 14 hours of 3G calls before a fully charged battery goes flat. However, the smartphone managed to pull off a surprisingly great performance here and topped this score easily. The Sony Xperia Z we had in our office managed to last 16 hours and 3 minutes on 3G talks. We tested two different units and they both did similarly here, so it’s not a lucky exception, either. It’s quite rare for a phone to outdo its official rating, and the Sony Xperia Z couldn’t possibly hope for a better start here. Unfortunately, the Sony Xperia Z wasn’t quite as impressive when it came to video playback endurance. With the 5″ 1080p LCD coming into play the battery lost 90% of its charge in just 5 hours and 39 minutes. It’s still enough to watch two full movies in one go, but it’s one of the worst performances we have seen here nonetheless. We ran the test with Mobile BRAVIA 2 turned on as we believed that’s how most users will be using their smartphones, but even when we switched it off we didn’t notice any big difference in the Xperia Z battery life. The Sony Xperia Z managed to climb up the ranks in the web browser test. It lasted for almost an hour longer compared to the video playback chapter as, unlike the AMOLED screens out there, its LCD screen consumes no extra power to display the predominantly white web pages. 6 hours and 37 minutes still isn’t something to write home about, but it’s still a decent achievement and better than the Oppo Find 5 and HTC Butterfly, which are the other two 1080p 5-inchers we have tested. As you would expect from with an ample battery like that, the stand-by performance of the Sony Xperia Z is quite good and helped it to a pretty good final endurance rating of 48h. Unsurprisingly, the Sony Xperia Z can last ages when the screen is not active (in-call and stand-by), but the display is quite power-hungry. Still, according to our result you will only need to charge your smartphone every 48 hours if you do an hour of each of the three tested activities each day, which is quite good. The stand-by test was performed with Stamina Mode disabled, so if you enable it there is a chance you can squeeze a few more hours out of your Xperia Z. To find more about our testing procedures follow this link.